Evelyn Beegan, an upper-middle class twenty-something, is struggling to find her identity amongst a sea of privileged one-percenters. Friends accumulated at her elite boarding school, and Evelyn can’t help but feel envious towards those who are unable to understand frugality, the necessity of having a job, and the financial pressures of everyday life. When she lands a recruiting position at People Like Us, a new social media agency that hopes to bring the elite together on one site, Evelyn finds herself thrown into the world she’s always wanted to be a part of. However, it comes at the cost of her herself and her bank account, an issue many millennials can relate to. Author Stephanie Clifford has experience observing the division of wealth within the U.S., as she covers issues regarding media, business, and the financial crisis’s impact on consumers for the New York Times (and won a Loeb award for it). Clifford’s book, “Everybody Rise” discusses consumerism, social class, and the struggle to finds one’s own identity in New York City. Clifford portrays the conflict between buying into advertised happiness and living in our current economy that can only provide small salaries and mounds of student loans. Despite the benefits of growing up above the middle class, Evelyn is pressured by her friends and her mother into feeling as though a fully funded education isn’t enough. For her mother, Barbara Beegan, life should be filled with lavish parties, dresses used only for one occasion, and socializing with the elite. This lifestyle would provide endless opportunities and result in a fulfilling life. When she finally feels as though she’s attained her mother’s acceptance and approval, Evelyn can’t help but maintain her new lifestyle and drive herself further into debt. There were several moments where I had to set the book down because I had either experienced the same thing as Evelyn or was so appalled at the lengths she would go to fit into a life so different from her reality. Would I apply for multiple credit cards to buy new clothes for a debutante ball? Absolutely not. But growing up, I can completely relate to the overwhelming feeling of frustration and confusion that is a result of being misunderstood and rejected. It was both difficult and entertaining to watch Evelyn dig herself deeper with her white lies about the challenges of being apart of the elite and life in this tier of society. The book captivates its reader through connection. We all have the desire to want more than what we have and have all struggled with finding acceptance, either with ourselves or from other people. The ending of “Everybody Rise” offers readers an original approach to redemption. Redemption through sorting herself on a personal level through accepting her current situation and choosing to do something about it, for example seeking out a financial consultant to get herself on a debt-action plan. It doesn’t include a savior, or a random bout of luck. In the end, Evelyn only has herself to get out of the mess that she has created. It all falls back to who Evelyn is, as an independent woman in this large world, struggling with debt as so many American’s currently are. Clifford seeks, and accomplishes, to reveal a message about finding identity in a world that promotes happiness through consumption. Check out an excerpt from Clifford’s new book, available August 18. 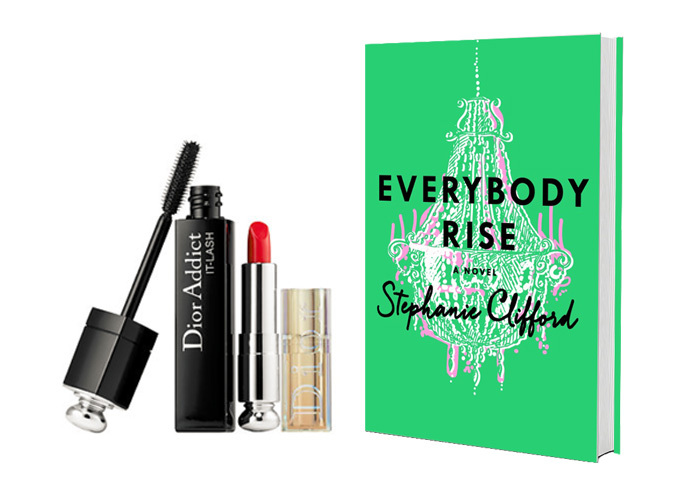 If you like it, be sure to enter the St. Martin’s Press giveaway for a New Day, New You prize that include a copy of “Everybody Rise” and a Dior addict make-up set! Enter to win by commenting below, or tweet @litdarling with #EverybodyRise and #ldgiveaway, telling us about a time when you found yourself buying something you couldn’t afford. Samantha is a Los Angeles based writer. She can also be found at Film School Rejects, HelloGiggles, and Sound on Sight.